The DCI World Championships will return to Indianapolis for the sixth straight year Aug. 7-9, 2014, and Hoosier Hospitality awaits! To fully take advantage of all three days of exciting competition you'll want to make sure you have your "home base" set well before you arrive to the Circle City's bustling downtown. We've put together special blocks of rooms in many of the most popular downtown hotels, and reservations are now being accepted! Playing host to some of the nation's biggest sporting events, from the NCAA Final Four to the Indianapolis 500 to Super Bowl XLVI in 2012, Indianapolis knows hotels. Boasting one of the most dense concentrations of places to stay (most within walking distance of the stadium!) in the more than 40 year history of the DCI World Championships, Indianapolis will put fans front and center, right in the heart of great dining, entertainment, cultural activities and more. 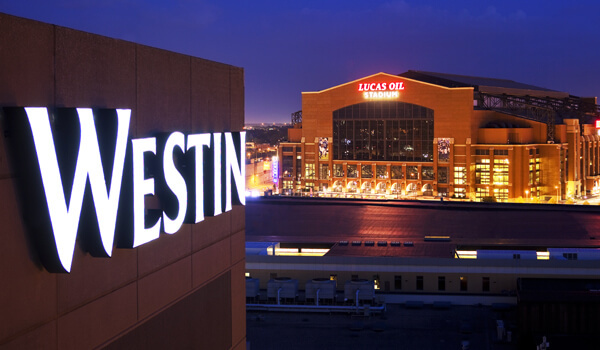 Photo courtesy of the Westin Indianapolis.